New Providence, Bahamas – Gary Sands is making history in the beverage industry worldwide. He is one of the youngest persons ever to take the helm of a major beverage company. At the age of 27, Gary has recently been promoted to General Manager of Bahamian Brewery and beverage with a staff of 60 under his management. 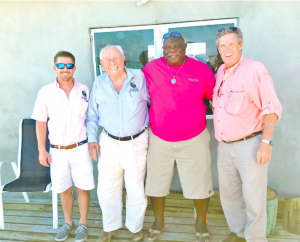 He will command the operations at all Jimmy’s locations in Nassau, North Eleuthera, and Abaco except for Freeport, Grand Bahama where the parent company, Bahamian Brewery, and Beverage Company is located. Jimmy’s has eight distribution centres in New Providence, Freeport, North Eleuthera and Marsh Harbor, Abaco. As General Manager, Gary is now responsible for the day-to-day operations of the company, and also has marketing, sales, and accounts under his purview. “It’s a huge responsibility – a huge undertaking, but it’s the great people who work with me who make all the difference,” Gary said about his new job and the team he has been commissioned to manage. The company, which has a staff of 120 altogether, is setting the pace for young business professionals in the country. Expect to find young managers running operations in the warehouse, accounts, distribution and marketing departments in New Providence and Grand Bahama. They are leaning on the expertise of veterans in the industry who also make up the Jimmy’s team. When Gary’s father James “Jimmy” Sands established the company ten years ago, he was able to successfully recruit a power team consisting of individuals who were loyal employees of his father from his days at Butler & Sands. As the company now celebrates its tenth anniversary, some of those veterans are heading for retirement and are placing the reins in the hands of a much younger, vibrant generation with great ideas to take into the future. One of those individuals, Berkley Williamson retired as General Manager. When Gary first entered his father’s business, it was never cut and dry that he would assume such a position in the company. It was through hard work, dedication, and passion that he proved himself worthy of the job. He notes that senior members of the team are readily embracing the new way of thinking and doing business, which is a “right now” attitude, “not tomorrow or the next day”. vodka, and Flor de Cana rums. Gary is using wisdom and soaking up every bit of knowledge he can about the industry. The relationship with AB InBev has taught him much about the industry and “their way of thinking” that drives sales. Whether it’s travelling to Germany to learn first-hand about the industry he loves, or communicating with affiliates in the region, Gary is rising to the challenge with the kind of success that made his father, the President, and CEO, have confidence in his ability. Kelly Sands, Gary’s sister, is also a vital component to the success of the company. As manager of all storefronts, Kelly never hesitates to take on any task, from driving the forklift to cashing, to delivering, to get the job done. Gary commends her for her vast creativity and for the success of her brainchild, the Travelling Beer Fest which takes Sands Beer throughout the family islands. It is his hope that their younger brother and sister – Mallory who is in university and James Jr. who is about to complete high school – will join the family empire that includes a multi-million- dollar facility producing some of the Bahamas’ favorite beverage brands. The company’s tenth-anniversary celebrations have included lots of giveaways and customer appreciation campaigns. The Scratch n’ Win promotion, for example, resulted in over $10,000 in giveaways during the campaign. Through Budweiser, Jimmy’s sent Bahamians on all expense paid trips; while the Presidente music vibe was a hit with music lovers. During the Christmas holidays, Sands Beer sponsored the Black Out event, which drew a large crowd and also proved a success. He feels that based on the fact that The Bahamas is a small country with citizens that have made a global impact, there is every reason for more and more young Bahamians to keep making history in whatever field they are engaged in. He encourages consumers to continue to invest in a “100 per cent Bahamian company”.